And found again in Cosmic I. The school is super excited to announce that our solar system is now in place. We had a bit of a shaky start with its installation but it is finally in place and switched on. The system is not visible from the ground, but extends across two roof tops and is a total 31.32 kWp system. It is fantastic for the school to be taking another step towards reducing our impact on the environment and simultaneously saving money! We anticipate a saving of approximately $55,000 over the next 10 years. Term 2 has been a trial of patience and physical constitutions as a wave of illness passed through the district sparing very few. The whooping cough outbreak has caused so much disruption to school and family life and tested the school’s capacity to communicate and monitor the confirmed cases and track the times of infectiousness through to the moment of giving the all clear. Rachael was tireless in her efforts to keep everyone informed, as was the whole admin team and I think the letter we received from the Health Department praising the school’s handling of the outbreak is a testament to the office’s hard work. Thanks team. We really appreciate all the parent’s co-operation and observance of the withdrawal periods, I know it must have been tough having sick children at home but it had the effect of limiting the outbreak effectively. 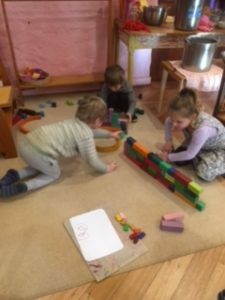 We talk a lot about rhythm and routine in a Steiner school and it may have become a hackneyed expression, but the longer I work in schools, the greater significance I feel it plays in everyone’s life, particularly in children’s lives. Children feel secure if they have some certainty about what is coming next, their confidence in life can grow, the more predictable it is. Rhythm and routine operate in small and large ways from arriving at school on time every day to the experience of seasonal festivals. Arriving late puts the children behind the eight ball as they are in catch-up mode from the outset because everyone else knows what is going on and has become part of the rhythm of the day. Arriving on time imbues your child with a message about valuing personal organisation, the value of other people’s time and effort and that your participation is valued and important. I know you have received a message from the teachers about the format about the Winter Festival this year. We realise it is a much-loved festival and one where we value the community coming together. The teachers had to make a decision about the format of the festival with a worst case scenario in mind regarding infection times of the whooping cough outbreak. We were looking forward to the full outdoor event but realised the timelines around the infection possibilities made it an organisational risk. We will be making the event as special as we can for the children and hope you are able to come and experience something of the event, albeit limited. I hope you all have something restful and nourishing planned for the holidays. I wish you all the best for the coming break with the chance to spend some quality time with your families. Over the school holiday period there will be qualified chemical sprayers on site to manage some of the noxious weeds that are currently under management plans for the region. As landholders we are legislatively required to control these. There will be no spraying of food producing areas. If you have any queries a copy of the Safety Data Sheet is available at the office. We are pleased to confirm that our Ring-a-Rosie places have been allocated for Term 4, 2018. The program will be run this year by Amie Sanderson and will be a small group. For those families that have missed out on a place, we will keep you informed if any vacancies become available. This group forms part of our Kinder 2019 class which is very healthy in numbers. The school continues to receive lots of enquiries for new students each week, which is exciting and bodes well for a healthy and strong future outlook. If you have any younger siblings coming through in future years please ensure we have their Expression of Interest form and application fee paid to secure a place. School Reports will be issued to families via email over the school holiday break. Parent/Teacher interviews will occur on Friday 24th of July and timeslots will be available online via the “Signup Zone” website. The link will be sent to you in a few weeks time and families will then have access to review all available timeslots. Most of you will already be familiar with “Signup Zone” from the Spring Fair, where it is used to allocate yourself to stalls and tasks. Please note for your diaries that Friday 24th July is a Pupil Free Day for these interviews. These discussions are between parents and teachers only, so please ensure you have alternative arrangements for your child during your timeslot. We are now out of the incubation period for Whooping Cough which is a big relief for the school. It is still important to remain vigilant for signs of illness as the winter months continue and keep unwell children at home. The local medical community and the Department of Health have been impressed and complimentary of our management of the situation, and the support of the school community has been fantastic. Please note our kinder festival is on on the 21st of June at 9.00. We offer our congratulations to Michelle, Rodney, Emmanuel and Gabriel and warmly welcome their new baby into our community. We have all been very busy in Prep preparing for our Winter Festival. The children have worked hard to sand beautiful wooden Candle holders and to paint and make their lanterns. Our Winter Festival will be on Thursday 21 June at 9 am. Please check your invitations for details. Our pizza lunches have been very popular this term. There will be no pizza in the last week but will begin again next term. Winter is certainly here. Please send a warm jacket to school everyday. Gumboots can be left at school ready for those muddy days. Wishing everyone a cosy and restful holiday. Finally everyone is back and well from the cold season. The children are again full of energy and really loving their knitting and craftwork. We’ve had a great term despite the illnesses. They are now hearing the stories of the Celtic Dragon Myth and they are really engaged with it. We’ve worked out that the singing and the noise on the roof that I heard at the start of the Term was…Mermaids singing and we’re pretty sure it was a dragon on the roof snoring! Have a fun holiday and stay warm and come back extra well for another brilliant Term! In our last Main Lesson, Class Six have discovered the wonder of the mineralogy world and of the geography surrounding them. They have started to create some beautiful maps of Australia and to look closely at how this land is organised. In these last few weeks of the term, Class Six are now entering the intriguing world of geometry with its wonderful world of shapes, angles and polygons. Accuracy in drawing and creating in these areas will be our focus. We have had a wonderful term filled with camps and excursions that have allowed the students to explore widely and to experience true co-operation with each other. May you all have a safe and restful mid-year break. We’ve had a wonderful time exploring the Middle Ages, hearing updates from each of the Class 7s as they work on their research projects, and so much fun working towards our Class Play! This week we have entered the world of Chemistry, through the phenomenon of combustion. We caused a bit of excitement as we managed to set off the fire alarm with our first experiment! Hopefully it wasn’t too much of a distraction to other classes. 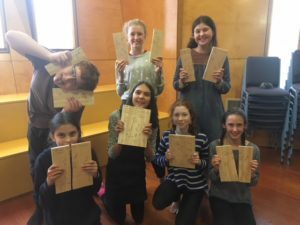 In Rock & Water, some Class 7s and 8s turned inner strength into outer strength, breaking pine boards with an open hand technique – a wonderful achievement! Wishing you all a pleasant and restorative winter break. Some recent pics of our frozen garden as winter sets in. Over the recent few weeks and continuing on until the end of Term 2, all of my classes have been participating in various gymnastics sessions. 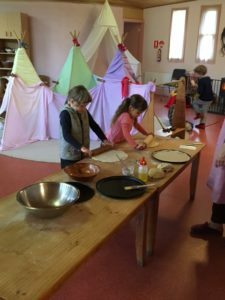 This unit always brings myself and the children great pleasure due to the wide range of activities we can perform and the fun involved. In the younger classes we first discussed the major attributes required for gymnastics, being strength, flexibility and balance. We then spent time mimicking animal movements, which requires all of the above mentioned fundamentals of gymnastics. This activity coincided well with Class Four’s Animals Main Lesson. Since our initial introductory lessons we have used the trampoline, vaults, tissue and gym mats to perform an array of gymnastic movements. 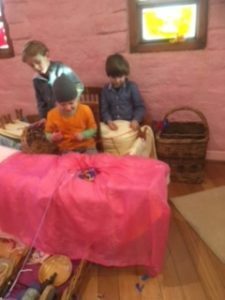 It is very pleasing to see the excitement shown by the children throughout, particularly when the trampoline and tissue are involved. It is just amazing how impressively athletic and flexible some of the children are. Equally as impressive is the determination and development shown by those children less experienced in gymnastics, but who are eager to learn and develop their skills. Well done children! Have a safe and restful winter break. Stay dry and warm! My work at school this term has had a lovely flow, which has brought insights and new ideas. The Spanish program of our school is a living creature that keeps growing and developing. We are about to conclude the units that we did during this term and next term will bring some new topics, stories and teaching strategies. These will bring a new air to the lessons and enjoyment to the children. For the time being, lets have a good break and see you next term. “It seems strange to talk about promoting good mental health in children. Shouldn’t all children naturally have good mental health habits? 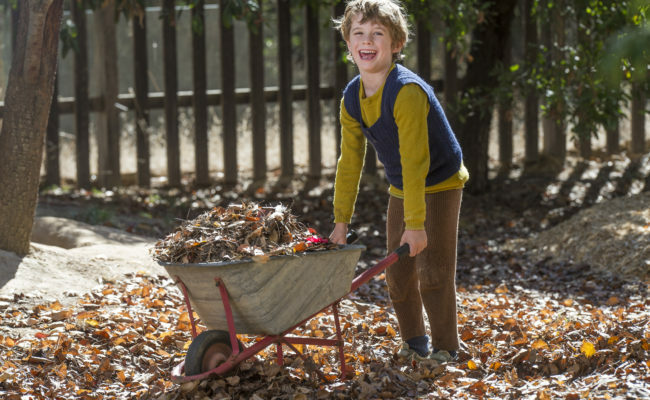 After all, childhood is supposed to be a pretty relaxed time of life, free from the pressures and stresses that come hand in hand with adulthood. Sadly, it doesn’t seem that way. According to the Australian Psychological Society one in seven Australian children experience some type of mental health issue, with ADHD, anxiety and depression being the most common. Having good mental health doesn’t mean kids don’t experience difficulties or worries. Feeling worried, sad or fearful is normal. Kids who are mentally healthy are equipped to handle many of life’s curve balls that come their way. They also don’t let their emotions overwhelm them. As a result they learn better and have more friends as well. I’m generally available Tuesdays and Wednesdays to assist children, parents and staff. Students interested in building skills in leadership, communication and decision making are invited to come along and participate in a day of training during the upcoming school holidays. The free workshop is for people aged 12 to 25 years and coordinated in conjunction with Mount Alexander Shire Council’s Youth Advisory Group. The training helps young people to develop the skills and confidence to create a positive change in their community. Participants will learn what to consider when planning a community campaign or project, along with the skills to achieve it. Training will be held on Wednesday 4 July from 10am to 3.30pm at Mondo Lounge, 30 Templeton Street, Castlemaine. Lunch is provided and places are limited. To register contact Shannon Lacy, Council’s Youth Development Officer, on 5471 1826 or youth@mountalexander.vic.gov.au by Friday 29 June. Find more information at www.mountalexander.vic.gov.au/YoungPeople or visit the Mount Alexander Shire Council Youth Facebook page. "Rewilding ourselves back to nature"
Australian Youth Orchestra 2019 - Applications open! Castlemaine Youth Theatre presents - Survival Hunter! Did you know dancing is good for your health and wellbeing? Join us to shake out the week at No Lights No Lycra Castlemaine. We get together for one hour every month to dance in the dark (well almost darkness) just for pure joy. The next dance session is at 8pm on Friday 11 May at West End Hall in Castlemaine. Cost $8. There are no steps to learn and no dress code. Just come along, enjoy the music, and create your own moves. For more info, follow our Facebook page No Lights No Lycra Castlemaine (@castlemainenlnl). No experience necessary – just a fund way to get fitter. Medicine Doll Making Workshop ~ for women. This is a fun, creative and nourishing workshop. We will gather together in sacred circle to make a spirit / medicine doll. Weaving in intention and blessing, connecting with your ancestors, guides and teachers and the realm of nature and this land to create a doll that reflects your innate gifts and qualities. I have been making dolls and felting for nearly 20 years and I love sharing this magical, healing and transformative process with others. The dolls are made with a process of needle felting fleece and incorporating medicine from nature. Needle felting is a simple and satisfying process of creating… the doll comes alive before your very eyes. Cost is $120 and I will supply all material, fleece, crystals, feathers, shells etc. ~bring along anything special you feel you would like to add into your doll. A $50 deposit is required to book your place. *This workshop is intended for adults. *children over 12 years old. *an all inclusive mixed circle. Extra lesson is a developmental movement programme. It is a successful intervention for children and adolescents with learning and behavioural difficulties. It addresses underlying developmental difficulties to enhance learning outcomes in all areas, through movement, rhythm, speech and painting. I am half way through a three year course with The Extra Lesson Institute. I am available for assessments and ongoing assistance on a 1:1 basis at a special trainee rate. Bits n Bobs for Sale ! Plays beautifully, ex Steiner student grown out of, $800 with hard case, in excellent condition. Happy for you to inspect first. 3/4 size, in excellent condition. Upright piano, Merrington Brothers, please contact Liz Harman on 0409 408 889. Music books also available.